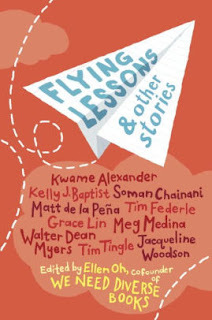 Ten short stories that share little in common (the first and the last one are about basketball) except that they feature unusual (and underrepresented) protagonists. That rather forced motivation to promote diversity in YA is tempered by the high quality of the contributions. All of these works are solid, but there are a few that really stood out for me. Matt de la Pena's story of a boy's quest for an understanding of basketball and of his father is poignant and touching (as the topic lends itself towards being) but transcends the usual male-bonding-over-sports theme. For different reasons, I also enjoyed Grace Lin's brief historical fiction about a female Chinese pirate. It's entertaining, yet fits in a nice plug for female literacy along the way. Finally, I give an honorable mention to Tim Tingle's Indian fable for making me laugh and for being the story most imbued with ethnic color. I wish that we were at a stage where diversity didn't need its own collection. These are good stories that would have enhanced any anthology of short stories.